A movie with a plot! This film recounts the experiences of a first-year law student in chronological order. There is nothing particularly interesting in these experiences, nor any insights into education, law school, relationships or any of the other things that movies try to enlighten us about. This film will appeal to lawyers who like to reminisce about their good ole days, and maybe law students, but only to them. Everyone else will be sitting, waiting for something to happen. But nothing ever does happen. Nor do we care about the people it doesn't happen to. Professor Kingsfield's use of the socratic method is actually a combination of the traditional socratic approach with the case study method.This approach is still common in many law schools. One of my dear history profs. in college taught socratically, but the approach made demands on the students. Socratic Method is still great for some other disciplines like religious studies, philosophy, and literature. However, the method presupposes an active student, not merely a student has is committed to doing only the minimum required for an A or B. For those to whom college is more about the love of learning than the freedom to party (this reviewer tended to fall somewhere in between) this is a pretty good film about the rigors of law school, but perhaps still not a great one. Some of the fault may lie with lead actor Timothy Bottoms, who doesn't entirely succeed in drawing us in. A better actor (or in any case a better script) would have made us really care about his fate, but Bottoms remains a bit of a cipher, as do most of the characters in this story. Houseman, of course, plays this perfectly, but we aren't supposed to understand him -he's from another generation and almost another world. This story was the blueprint for many "training" movies made since - a small cadre of competitive young bucks are thrust together to master some skill that will push them to the limits of their abilities. They're different types from different backgrounds, a girlfriend, a wife, and maybe a death or two among them. But we aren't training fighter pilots here, it's Harvard Law School, where the most exciting thing that happens is getting called on in class, so viewers should be prepared for the fact that there's really no action. Which is not to say that this isn't an interesting film (certainly the best film ever made on the subject of Studying Contract Law) but this is not "Top Gun", or "Officer and a Gentleman" or even "Meatballs" and it would be a mistake to let the film's accolades convince one otherwise. The real power of this story is with the students who fall by the wayside, unable to compete in an environment where competition is everything. Their story has a "Death of a Salesman" punch that really has to carry the film, since very little actually happens to Bottoms' character. His relationship with the professor's daughter is very shakily presented - one suspects that scenes between them were cut, because they often shift gears inexplicably. Ultimately there's a problem of artistic distance. Director James Bridges assumes we will relate to the bearded, hippie-ish, privileged intellectual Bottoms, whose grades will determine whether he becomes one of the men who run the world, or whether he will be forced to settle for merely being inordinately wealthy. Those who relate best (real-life lawyers and law-students should be shoe-ins) can be excused for loving this film, but many others will surely see these characters as detestably greedy, self-centered, and elitist. High-school teachers and college professors can expect to see some recognizable characters and pick up a few tips on the Socratic teaching method, which might make the experience worth their while. But women should be unsurprised to find that they are only bit players in this story, and as for minorities, there's none of the diversity we've come to expect in modern films - people of color are completely absent. Yeah, great film, holds up well over the years. But no Harvard law student would have thrown his unopened grades into the ocean. Particularly one that was as dedicated and competitive as Hart. It would be like a lawyer trying a case and leaving the courtroom before hearing the verdict. One can understand and, in a mercenary way, perhaps admire Hart if he pretended not to care about the grades for the sake of impressing his erratic, anti-establishment/anti-hippy girlfriend. She doesn't make much sense, but she is cute and alluring. But to actually throw the grades into the sea? No. Apart from that, the scenes of the workings of law school are pretty terrific. The characters of the study group are, for good and bad, very similar to people you actually find at law school. Particularly Bell. (By the way, did anyone notice that Hart's 3rd year advisor was Thirtysomething's Miles Drentell? He is exactly the type that would say, "Grades matter.") Yet, like lawyers themselves, they're not on the whole really awful people. Ford, the quintessential Harvard prepster, bails out James Naughton's character in class and even goes so far as to say that the subject is very difficult to understand. Hart himself is obviously very decent. And Kingsfield is meant to be feared, but moreover respected and admired. Great movie, just not too thrilled with the broken DVD case that caused DVD to be rattling around freely in case prior to delivery. If I didn't think it would have been a hassle, I would have asked for another. Again, a great movie. Actually, I'd forgotten what a good-looking woman Lindsay Wagner is! Wow! The most accurate law school movie ever! If you want to be inspired to go to Harvard Law School or Harvard Business School (they both use the same intimidating case study technique), this is the film to watch. It is the fear of having your name called out by the professor -- from the hundred students in the lecture theatre -- with his request that you lay out the case, that drives you to prepare well into the early hours the night before. The law school culture clashed conspicuously with the student background of the 60s/70s -- i.e. drugs, rock and roll, protests about Vietnam etc -- although little is made of this in the film. Instead we follow a year in the life of Hart, the Nice-but-Bright law student who idolises Professor Kingsfield -- determined to know everything about him, to the extent of bedding his daughter (played by Lindsay Wagner in her pre-Bionic Woman form). In this film, the lecture theatre experience (studying Contract Law with the Prof) turns out to be a breeze, compared to participating in the Study Group, which contains some really unlikeable individuals. By the end, three of the six students have dropped out of the Study Group -- one even tries to shoot himself. In the end, this film probably would be better if it didn't try also to be a romance. (I guess it was competing with 'Love Story' at the time.) Its highlights come in the lecture theatre and the study group. This is the potential for a very dark story, and I feel the director missed that opportunity. On the other hand, no accommodation is made for the audience unfamiliar with contract law -- in other words, there is plenty of technical language -- but this adds to the authority of the drama. There are plenty of movies with a little romance, a little drama, and a little comedy. This movie is special because it portrays law school is such an entertaining, and somewhat accurate manner. It also explores the themes that we all constantly wrestle with, our natural intelligence, hard work, or ultimate capabililties, and what we are willing to sacrifice to get ahead. The feckless and overly orthodox law professors that pollute the halls and classrooms of our nation's institutes of higher legal learning won't teach you as much about law school as this film will. The professor who appears in this film acutally explains his teaching methodology, the antiquated Socratic Method, which inspires students to learn and read through fear, which amounts to pointless question and answer sessions, which baffles students who once believed themselves to be intelligent before they were humiliated in front of their class! Professor Kingsfield's lectures and question and answer sessions in this film are frightening and are timeless displays of eloquence, much like Gunnery Sergeant Hartman in Full Metal Jacket. This movie, like no other, explores the fear and stress that law school students feel as they try to chase the paper, as they try to chase the grade. Our protaganist goes through the same struggles as real law students, as he must decide between personal and school. Will he chase the girl that he is falling in love with? Or will he spend the weekend studying? Will he become the silent law school student that hopes that he does not get called on, or will he burn the midnight oil and become part of the upper echelon of law school students that savor the spotlight and volunteer to be participants in the feared Socratic nightmare? Will he fall prey to the paper chase and sell his sould to get the grade? You'll see law students crack, you'll see friendships fail, you'll see betrayal and competition, and you'll see disappointment in the face of the student that just can't hack it. You'll get a sense of the conflict that is played out in the minds of those students who have the natural ability, but are conflicted whether or not they want to put in the work and take the pain that is necessary to succeed in law school and be at the top of their class. The movie was an interesting example of a first year law student learning to think in questions (Socratic Method) and develop his ability to see the underlying meaning. John Houseman does a great job in the role of professor and Timothy Bottoms does a good job as the student in question. It was an enjoyable film. The movie is not a masterpiece but is interesting from a graduate student's perspective. The ability to see the pressures involved and to see how relationships are played out is an interesting side story. The best scenes are in the classroom and in the study groups. Overall, I would recommend to any one attending business or law school or who is interested in learning via questions. I recently watched this movie after not having seen it for many years, and I am amazed by the accurate portrayal of life for 1Ls and of the "types" of people you will encounter in your first year of law school, regardless of whether you attend Harvard or any other law school. John Houseman gives an outstanding performance as the curmudgeon Prof. Kingsfield. He succeeds in rattling Hart (equally well portrayed by Timothy Bottoms) and teaching contracts using the Socratic Method, a torture device until students learn how to play the game and begin to think about the nuances of the law. Some viewers have commented about how dated the film is, but I must respectfully disagree. The hair, clothing, and some of the attitudes are dated--after all, the movie was made in 1970! At that time, both men and women had long hair, wore flares (jeans and cords), lots of browns & beiges, etc. That was the style, pure and simple. Racial, gender, and ethnic diversity in the classroom was pretty nonexistent, and the virtually all-male student body accurately reflects those times as well. 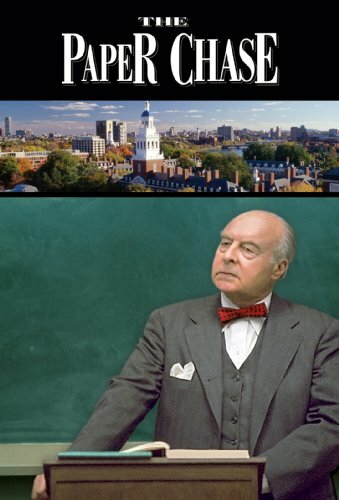 What has not changed is the portrayal of how 1Ls adjust and adapt to law school (it is so very different from the undergraduate experience, as the unfortunate Mr. Hart learns on the first day of class! ), learn to help eachother master first year subjects such as contracts (emphasis on contracts in the movie), property, civil procedure, criminal law, torts, and constitutional law, or turn on eachother as they realize just how important those first year grades are to their futures as law students (competition for an invitation to serve on the Law Review) and attorneys. This is what makes this movie as pertinent now (for law students and would-be law students, at least) as it was in 1970, because the types of students in the class will remain the same, the huge learning curve, the Socratic Method, the study groups and obsessive outlining, and the way that the law permeates every thought are timeless. Unless law schools institute substantial changes in law school pedagogy, this movie will be accurate 100 years from now. The romance between Hart and Susan is not what drives this movie, but adds human interest to this look at the lives of 1Ls. Houseman won Supporting Actor Oscar for playing legendary Contracts Professor Kingsfield in this dated Vietnam era classic. A man of intellect and intimidation, Kingfield's Socratic method of teaching works well with this assemblage of intellectual "mush", which he tries to embolden to "think like lawyers".Key scenes include an opening day scenario in the lavatory, Hart being caught at the Prof's home with the latter's daughter, the library break-in, cramming for finals, and the beachside finale. Both Wagner and Bottoms play their roles well, and any serious college student could/can still relate to most of the movie. As implied, this is not a movie for everyone; only for those who are looking for a multi-sided nostalgia trip. This is a decent movie, but hardly depicts the way that law school is, either in the late 1970s or espically in 2007. Professors today actually try to get AWAY from the Kingsfield sterotype that this movie created. Of course there are exceptions, and professors still use socratic at times, but it is very "soft." People can pass all the time in class, say i dont know, and NOTHING happens to them, indeed nobody even cares or looks up from playing games on their laptops. So I got this movie because my law school professor swore by it and went on and on and on and on and on about how ALL of the law students when he was a law student were forced to watch this movie the night before law school started to scare the living daylights out of them. Eh. Not so much. The movie does have good qualities about it by showing you how a law school environment works and the kind of stress that a beginning law school student is going to be under...but, the movie is just boring. Blehhhhhhhhh....I couldn't wait until it finally reached it's climax and conclusion. I'm sure that at the time that the movie came out it was all the rage. I am an older student who just finished my first year of law school. The film is right on when it depicts the battle for your soul--will you be master of your fate and choose to do the work, or will you be driven by fear and insecurity and be enslaved to it? I experienced a little of both, and I do not want to spoil the film by revealing more to any who are trying to decide whether to buy or rent it. I heartily recommend it to anyone struggling with a self-imposed challenge. I would have wished that the film show more of the process of learning to "think like a lawyer" and what that actually means - turning the facts of the case over and over, looking for points to the advantage of either side, and weighing the relative strength of those arguments. However, I do commend the film for showing a little bit of the feeling I quite unexpectedly experienced of being part of a line going back to the Magna Carta, examining the value of a human being and her freedom and the needs of society and searching for the ever-evolving meaning of justice. As for the relationship between Kingsfield and Hart--my main professor was nothing like Kingsfield, but I did experience something eerily similar, right down to the last scene. One last aside-A previous reviewer noted the absence of the Carbolic Smoke Ball case from his edition of West--it is certainly in mine and is a very important case with regard to defining the law of a public offer. Doesn't live up to expectations. "The Paper Chase" is that movie that terrifies future law students with visions of cut-throat competition and horribly stressful conditions. If you realize it's heavily fiction, you can take if for what it is: a unique movie about high stress and how people react to it. John Houseman is unforgettable as the notorious Prof. Kingsfield. I am currently a law student at a top-20 law school (2003), I have plenty of friends who attend the other top-20 schools in the nation (including Harvard, portrayed here). Even when this film debuted in 1973 it was considered a high dramatization to strike fear in the non-law student. If you're considering law school, watch it realizing that. The Paper Chase shows the darkest view of law school as much as Legally Blonde makes it out to be silly and fun. Law School is neither: it's that boring movie no one would ever pay to see. John Houseman was part of the entertainment world for decades, working with such heavyweights as Orsen Welles, but perhaps popularly he will be best remembered for his portrayal of Professor Kingsfield, a conservative, dour Contract Law professor at Harvard Law School, who, for all his professionalism and singleness of purpose, lets a bit of humanity creep out from beneath the surface. Houseman won the Academy Award for Best Supporting Actor for this role. Timothy Bottoms played Hart, the idealistic young 1-L (first year law student) who comes to Harvard from the midwest primarily because of his fascination with Kingsfield. He forms friendships and relationship with a circle of friends, each of whom is eccentric, driven, and slightly certifiable (which fits most of the law students I've known). His problems increase as he meets and begins a relationship with Kingsfield's daughter (played by Lindsay Wagner). This movie provided the inspiration for a television series, which followed some of the same characters from the film, in necessarily a different time-frame and different situations. Houseman reprised his role in this, and became a 'star' by this vehicle. My favourite scene in the film has to be (being the bibiophile that I am) the time Hart breaks into the closed stacks in the library (which contain the personal papers of the professors) to look for Kingsfield's early work, including his original notes from when he was a student in Contracts. Hart's reflection on Kingsfield's philosophical musings ('Can one make a binding contract with God?' Kingsfield had written) almost convinced me to go to law school in America (and indeed, I took the LSAT and did well). Houseman found the role of Kingsfield a double-edged sword, that, while fueling his stardom and exposure, also obscured the real person behind the role. He became typecast. Even when he went on speaking tours (coming once to my university to speak before a standing-room-only crowd at the auditorium) his Kingsfield routine was what the audience wanted; they tended to drift away as he spoke about his own life, and that was sad. VHS VIEWERS BEWARE: I watched two different VHS prints of this movie and in both the color was horrible: all the dark colors had a blue tinge to them. Perhaps the transfer to DVD corrected the problem, but I can't say. Timothy Bottoms is a Harvard Law School freshman in love with both his no-nonsense, unaccessible law professor (John Houseman) and the professor's daughter (Linda Wagner). Bottoms keeps skirting back and forth between making the grade in school and being more intersted in learning for its own sake. When at the end of the movie he folds his term grades up into a paper airplane without looking at them we're supposed to believe he's made the "wise" choice - but it's all pretty phony.